Is this the plastic fantastic casing for the 'budget' Apple iPhone? A case for the suspense? The first plastic iPhone since the 3GS on the way? Could this be another sign that Apple is preparing to launch a more affordable iteration of its world-changing iPhone handset? The picture above is a purported plastic rear casing for a device which, speculation suggests, Apple could reveal in September or October. The leak comes from Chinese blogger 7mob, who SlashGear reports, is renowned for his connections to 'factory sources' in the country. 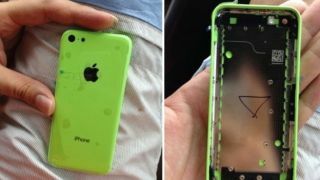 The casing, which could of course be a phoney, also showcases the bright iPod nano-style colour, also rumoured to be a calling card of any cheaper iPhone. Recent rumours have suggested that the affordable iPhone handset, would be enclosed in a plastic casing in order to reduce manufacturing costs for the company, with savings passed onto the customer. The device is expected to target emerging markets rather than the US and Europe, opening up iOS and the App Store to those who may not have been able to afford an iPhone for the first time. Of course, the device has been rumoured for years, so we wouldn't be at all surprised to see Apple hold off a little longer before it launches the device. The cheap iPhone wont be as cheap as we think, according to the manufacturer rumoured to be building the device.